Phantom Brave: The Hermuda Triangle brings some pretty awesome strategy RPG action to the PSP in an awesome port of the original. Phantom Brave: The Hermuda Triangle is a pretty fun game. Having never played the first one, I had no idea what I was getting into when I started it up but it’s extremely addictive and a lot of fun to play. One of the coolest things about this game is the deep complexity of the character customization. Through character creation and fusion, as well as utilizing the blacksmith and acquired mana of characters and items, you can create completely unique characters that cater to your style of play, with unique abilities and titles. See, as you go through battles, the characters involved and their weapons accumulate mana, which can then be used to strengthen the weapons or unlock new skills, or you can use it to fuse items and characters in order to create much better weapons or even stronger characters. You can even fuse items WITH character. One of the other awesome things is that, as the rogue or healer or blacksmith or fusionist level up, you pay less and get more. The rogue obtains better items, the healer needs less money to heal everyone, the blacksmith needs less mana to improve weapons, and the fusionist performs better. As you progress through the game, enemies that you defeat eventually join you, giving you more depth to your army. The story follows Marona and Ash, her phantom companion, on their quest to save the world, and just make a living by defeating phantoms and getting paid for it. The story isn’t ridiculously amazing, but it has character and depth and it is certainly enjoyable. The voice acting isn’t bad either, and it makes each character unique. Overall, the graphics are great and the sound is pretty good, too. Each world is different and vibrant and looks great. Ultimately, one of the coolest things is probably the Dungeon Monk. He allows you to create an endless amount of dungeons that let you level, grind, get mana, items, and wreak havoc upon hordes of hordes of monsters. Completing a dungeon nets you a title, the strength of which is dependent on the difficulty of the dungeon itself. You can put this title on any character or item, and increase (and decrease, depending on some of the title’s attributes) the stats and elemental affinities of whatever possesses the title. Overall, the game itself is pretty awesome. It’s a lot of fun to play, the action during stages/dungeons isn’t ever really slow or boring, and the dungeons themselves can get pretty intense. 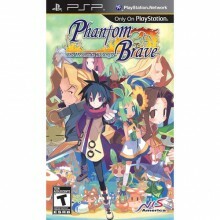 If you’ve never played Phantom Brave on the PS2 or Wii, and you have a PSP, then you should absolutely play this title. It’ll last you a long time, and there’s even a second mode (Another Marona) which extends gameplay even further. You will not be disappointed.